We don't have any trips to Bahamas at the moment . Composed of more than 700 islands, the archipelago of the Bahamas is one of the most paradisiacal places in the Atlantic Ocean. Its white sand beaches, surrounded by palm trees and bathed by crystal clear water, are the perfect destination for those seeking a relaxed and sunny holiday. Colonized by the Spanish and, later by the British, the Bahamas show a mixture of architecture from different eras where the buildings of coloured wood stand out. These can be seen especially in its capital, Nassau, the largest city of the archipelago located on the island of New Providence where most hotels, shops and leisure activities are concentrated. Its history and folklore have also been immortalized in many of the forts and museums of the city. A few miles away, located directly opposite, we find Paradise Island, another essential stop on a trip to the Bahamas where you can enjoy great beaches and its marine biodiversity. It is home to one of the largest open-air aquatic museums in the world. Besides being able to snorkel or scuba dive, this island is ideal for golfing, fishing or sailing along its coast. 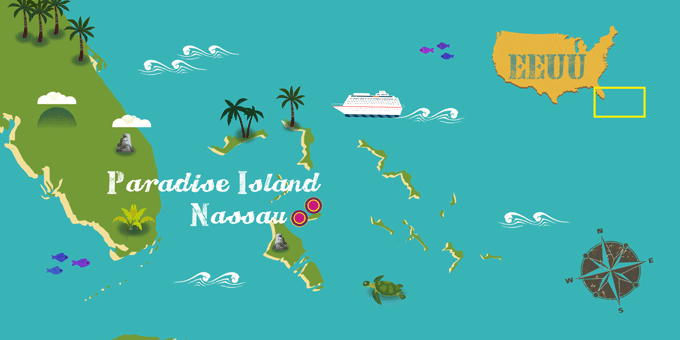 If Bahamas has caught your attention, leave us your number so we can call you to discuss the voyage that awaits you.